American DJ Gobo Projector LED DJParts - All Variety of Parts that DJ Needs. 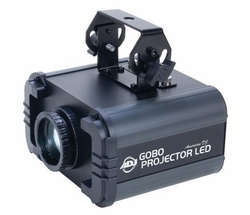 • High quality optics - Clear powerful output • FX Switch on rear panel for static or slow rotation of gobo • Includes 4 replaceable gobo patterns (3 metal; 1 glass) • Gobo size: 26.8mm; Viewable size: 24mm • 4 color gels are included (Red, Green, Blue & Yellow) • Run all night - No Duty Cycle • Easy Gobo replacement access • Manual focus • Ideal for Mobile DJs, Clubs, Bars, Retail Stores and Promotional Events • Great for projection lighting where fog can''''t be used • Project on ceilings, walls and floors • Very low heat output • Beam Angle: 13 degrees • Long Life LED: 30,000 hrs • Lux @ 3M: 540 Lux • Compact light weight design • Includes hanging bracket and safety hook • Switchable voltage: AC120V/60Hz or 230V/50Hz (IEC type plug) • Power consumption: 12W max • Dimensions (LxWxH): 8.75”x8”x4.25”/ 218x200x108mm • Weight: 7 lbs. / 3 kg.